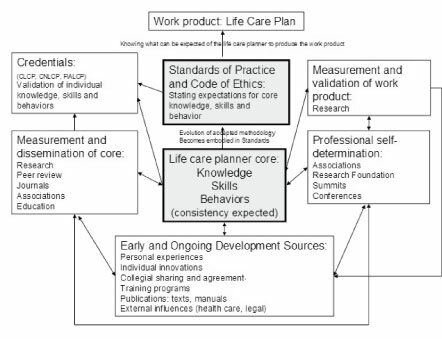 Standards of Practice are intended to define the core knowledge, skills, and behaviors that life care planners should use in the course of work. Because these change over time, changes to the Standards of Practice are natural and necessary. The depiction below of life care planning practice shows the complexity and interaction of all aspects of this field, creating symbiotic relationships to promote growth and development. At the core are knowledge, skills, and behaviors, which are continually influenced by internal and external factors, creating a continuous process of change. Click Here to learn more about the Standards of Practice for Life Care Planners.